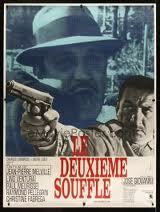 For some years now, whenever Rialto Pictures (it usually was) had selected a foreign film for theatrical reissue, I was given to wonder when they’d get around to Jean-Pierre Melville’s Le Deuxième Souffle, known in English as Second Breath. Not every time would I wonder it, and not always out loud in print, but most likely whenever another of Melville’s films had been so selected: Le Doulos, Le Cercle Rouge, Army of Shadows. With the release of Le Deuxième Souffle on DVD last fall, the time appears to have passed. Once a thing is on video, it’s as good as lost to the big screen. That’s a pity, but the upside is that the thing under discussion is now available on DVD, available locally at Kensington Video (alphabetized under “L”) or wherever fine DVDs — the Criterion Collection in specific — are sold. This fully restored version, if I can believe my arithmetic, boasts twenty-five additional minutes over the 16mm print I long ago used to rent when teaching Crime to undergraduates, the only version upon which I’ve based my opinion that the film, in spite of its sporadic bumpy zoom shot, is Melville’s supreme masterpiece. (Not his sole masterpiece. Le Samourai, a touch more immaculate in technique, is one of those, too, dated 1966 and 1967 respectively.) I have finally, thanks to a week of nothing but Fast and Furious and Adventureland, gotten around to renting it and watching it. It all came affirmatively back to me: the geometrized prison break in the cold gray (black-and-white) dawn; the seven silent minutes to the first line of dialogue; the five-minute unobtrusive single take as the prissily sardonic police inspector (Paul Meurisse) sizes up the scene of a nightclub shooting, supplies all the answers and alibis to his own questions, and proves himself in the course of this virtual monologue the equal of Melville (or vice versa) as an aficionado of the underworld; the pregnant first look between the escaped convict and the cotton-candy-haired gun moll at their reunion, matched and surpassed by their pregnant last look much later on; the protagonist’s trademark killings in a moving vehicle; the mountain-road stickup of an armored car; the superb ruse by which the policeman gets the gangster to spill a single bean; the evocative shots of dark-coated figures in a landscape, scantily clad chorines on the dance floor, abstract polygons of light and shadow; the spare, neurotic jazz score; the stoic camaraderie and the stern judgmentalism about good people and bad, whether crooks or cops. And through it all, that great block of granite, that craggy colossus of the French screen, Lino Ventura — a block with worrisome cracks in it (is he over the hill? all washed-up? ), a block that undergoes liquefaction over his deviously induced betrayal of his cronies and his principles, an unnerving turn of events that can only be put right by doffing his fusty mustache-and-glasses disguise, donning a regulation trenchcoat, and doing penance by way of a two-gun suicide. Near the end, my most treasured sequence in all of Melville leaves Ventura out entirely, and centers on a subordinate figure in the large population of characters, a natty iceman (Pierre Zimmer) with the sinister name of Orloff. “He’s all style and no action,” someone appraises him. Well, let’s see. It is he who is tabbed as the protagonist’s go-between at an assignation with three ticked-off mobsters. As a precaution, he visits the meeting place ahead of time, picks out a spot atop an armoire where he can stash a gun out of sight from normal human height. He practices standing with his back to the armoire, reaching up over his head, pulling down the gun with the business end forward. He goes away satisfied. Then the gypsy triggerman from the hostile trio also checks out the meeting place beforehand, finds the gun, keeps it. He’s satisfied as well. Comes the meeting. The talk turns testy. Orloff sidles over to the armoire, positions himself in front of the empty hiding place. The gypsy tenses in anticipation, eggs him on. Mr. Cool Cat is about to have his fur ruffled. You’ll need to see the film to find out what happens next, a moment even more magicianly than the one in Le Samourai when the professional assassin unveils his white gloves from beneath a washroom towel. And, as I would tell the undergraduates, this alone should suffice to deter us from a life of crime: we’re not smart enough. To object that Melville glamorizes his subject would be to miss altogether the point of a film that is manifestly a movie buff’s fantasy. Aside from that, the film is doubtless a “meditation,” as they say, not just on the gangster genre but on themes of loyalty and trust, aging and death, sang-froid and savoir-faire, arbitrarily in gangster garb. Any piddler of course can meditate on such stuff. It takes a true artist to arrange his thoughts and feelings into a form that will fully express and validate them. Many a filmmaker loves gangster movies, pays homage to them, imitates them. Melville improves them. His love runs deep. I can’t say that the extra twenty-five minutes, when I could identify them, added anything to the film but length, two and a half hours all told. Mere length is not nothing, however, in a film I never want to see come to an end. The extra minutes necessitate no revision in my previous opinion of it. As long as I was at Kensington Video getting Le Deuxième Souffle, I also got Enzo G. Castellari’s The Inglorious Bastards in order to prepare for Quentin Tarantino’s remake of it later this year. You could hardly pick a more random film to watch, much less to remake, an Italian knockoff of The Dirty Dozen about a dirty quintet of U.S. deserters heading for the Swiss border in the Second World War, mistakenly mowing down a squad of Americans disguised as Germans, and redemptively taking over their top-secret mission. Needless to say, Quentin Tarantino taking an interest in a movie is a boon somewhat akin to Oprah Winfrey taking an interest in a book. And sure enough, there he is in the flesh in a Special Feature on the disk, ostensibly in conversation with Castellari, who, for as long as I stood it, couldn’t get a word in edgewise. A second DVD was required, in a manner of speaking, for a couple of documentary featurettes on the film, in case anybody wants to know what Bo Svenson looks like nowadays. But the “requirement” of a two-disk set of this derivative mediocrity, vintage 1978, is a real head-scratcher. Even with the extraneous mystery of what Tarantino saw in it and what he can possibly make of it in a remake, there’s precious little joy in it. The cigar-chomping Fred Williamson and his Seventies hair and mustache, if not funny in themselves, will remind you of how funny Robert Downey, Jr., was in Tropic Thunder. And an Aryan bathing beauty earns a bark of laughter when she cuts loose with a machine gun au naturel. Another laugh might be extracted when you realize that Ian Bannen, whose first language is English, has been dubbed in American. Otherwise the film is useful only as another pebble in the mountain of evidence of Tarantino’s untrustworthy taste (I wouldn’t say unequivocally bad taste, since he also admires Melville), and perhaps, too, as a strong candidate for a selective list of silliest movie titles. If I seem to be shirking my responsibilities, I should need to put up no more defense than to point out that my responsibilities this week extended only to Hannah Montana: The Movie, Dragonball: Evolution, and Observe and Report. (Landmark Theatres, still reserving room for Slumdog Millionaire, offered little better: Shall We Kiss? and The Mysteries of Pittsburgh.) Elucidating the minuscule degrees to which Observe and Report might be superior to Paul Blart: Mall Cop doesn’t strike me as lighting the way to the marvels of cinema. Citing “the effects of the economy,” the Museum of Contemporary Art has announced the termination of its monthly film program and its film curator, Neil Kendricks. A monthly program did not convey much commitment to film in the first place, and the eclecticism of the programming further retarded a sense of identity. But a loss is a loss. April 15, 2009 @ 10:12 p.m.
You write "Elucidating the minuscule degrees to which Observe and Report might be superior to Paul Blart: Mall Cop doesn’t strike me as lighting the way to the marvels of cinema." A shame. Had "Observe and Report" come out a bit earlier, you could have reported exactly on the nuances between the two films for a glorious April Fools essay. April 19, 2009 @ 1:52 a.m. Ya know, mateu...that's a great idea for a future column. Duncan could take some movie, say a horrible Adam Sandler film...and he can give it 5 stars, and talk about the performance bringing Sandler a possible Oscar nomination. And this, all as an April Fools prank. Sports Illustrated did that when I was a kid, with a pitcher from Iceland that threw a 115 mile an hour fastball. That inspired me to get involved in a piece for our school newspaper, in which we said a two-way mirror was found in the girls bathroom. Although, not sure how the boss would feel with us using the printed page for jokes.